The Jands Vista S3 is a compact version of the Vista that puts all the revolutionary features of the full-scale console into a desk you can fit under your arm. The S3 gives you all the features that make the Vista such a great live desk: big, clear LCDs, fader banks you can split or combine and a set of user configurable shortcut buttons. With 20 playbacks (10 with faders), four DMX outputs, timecode input midi input and three encoder wheels, you‘ll have all the control you need. 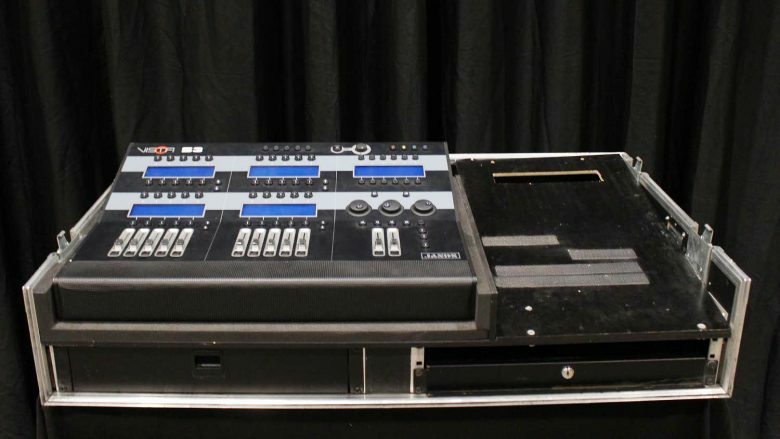 Of course, the S3 also features the Vista‘s incredible generic fixture model, so no matter what rig you‘ve programmed your show for, the S3 adapts automatically if you have to run the same show with a different rig, without the need for re-programming. Designed to be used with your desktop or laptop, the S3 is a Vista without the computer hardware components: we provide the software and the control surface, you provide the computer. Install the software, connect your PC to the S3 with a USB cable, and you’ve got a fully-operational Vista console. Utilises LCD and Encoder wheels for display and real time control of playback and other advanced functions.